Warrington Wolves' marquee signing Blake Austin cannot find a bad thing to say about life in England since moving from Australia over the winter. Well, apart from the fact he is missing his favourite meal. The 27-year-old would give anything for a humble chicken schnitzel - a staple of Aussie pub grub. "Chicken schnitzel and chips would be good, I haven't found one of them yet," he laughs. "The nearest I've got is a parmigiana." Otherwise though, in spite of the cold at Warrington's sun-bathed Halliwell Jones Stadium, Austin is in good spirits. In fact, the stand-off - lured to Super League from National Rugby League side Canberra Raiders - and his family are "loving life" since swapping the Australian capital for the north west of England. "The one thing I'm enjoying is that it's a bit more relaxed over here," he told BBC Sport. "Australia is so fast paced and everyone's in a rush." "You spend a bit more time with your kids and family. It's all relative to what you know. I'm from Western Sydney, which is a working class part of town - the bum end of the world to most people and they give you a bit of stick for being from that part of town. "Everything I used to do back there I can do here. I'm loving life. We were always confident the lifestyle couldn't challenge us. The weather is the main difference. "It gets cold sometimes in the morning. It tricks you when the sun is out. It's no warmer but just a bit more picturesque." Austin's NRL exit was a shock on both sides of the world, as more recent imports have tended to be players at the tail-end of their careers rather than ones approaching their peak. He played 122 elite level games, represented New South Wales City under current Blues coach Brad Fittler and also played for Portugal earlier in his career. Not even the offer of a deal from boyhood favourites Parramatta could sway his thinking, as the prospect of a new way of life came to fruition. "I knew early on I needed a change," Austin said. "I had been at Canberra for four years and felt like I needed something different. "I knew there would be risks in that, I turned down a couple of contract offers from the Raiders and a lot of people would say I was stupid if they saw the size of the offers I was turning down. "Happiness is something pretty big for me, I was coming home and I certainly wasn't as happy I'd like to have been. Warrington popped up out of the blue and I enjoyed my chats with Steve [Price, head coach]. "I've never been scared to do things differently. The most difficult thing was going to be the first few months without the footy. Once the footy comes around the weeks go by a bit quicker. "We've settled in better than what we could have hoped. It doesn't mean we'll love every bit of life over here all the time, but we're giving ourselves the best chance and we're really embracing the UK lifestyle." In some respects it is easy for Austin himself. He pitches up, has a ready-made bunch of pals in his new team-mates and goes about the job he loves. What about the rest of the family, such as his partner Gillian and four children? "I've got to give full credit to my partner and the kids for the way they've adapted," Austin continued. "The kids are so adaptable, they aren't fazed, they just go for it and embraced it. "My partner has been around for every moment of my career and understands what goes with it. "The move to Warrington certainly wasn't something that worried her too much and it's reflected in the way we're enjoying life." With the Super League season kicking off on Thursday, Austin was needed over in England during the Christmas period to take part in pre-season training. New surroundings meant new traditions, missing out on the usual celebrations with family and friends back home. "There were a few moments when I struggled and missed home a little," he said. "We actually book a cabin every year on a big lake. It's 35-38 degrees every day and the kids have a ball. Well, we already had that booked and, because I'd already paid, I gave it to my mum and my brother and they went and enjoyed it. "They were sending photos every day, I'd be lying if I said I didn't miss my family but we wanted to stay over here for Christmas. We're a family of six, and we found a way to enjoy Christmas in a different way to how we normally do." The kids had a unique taste of northern hemisphere Christmas traditions too. "They were praying for a bit of snow," added Austin. "But, if I'm honest, the spirit of Christmas has gone out of Australia a bit. It was refreshing to be over here in the festive season and see what trouble you guys go to. There are light switch-ons in every town. "The kids started school at a time which was very exciting. There was something happening every night of the week." Austin and family have already made friends in their village, although initially the locals had no idea a high-profile Australian sportsman was in their midst. "I'm living somewhere where there aren't so many Warrington fans as in the thick of it," Austin said. "We've gone under the radar. "My neighbour came over, I'd spoken to him a few times, and he'd seen a newspaper article on me and realised who I was. "He's a football fan. We're going to try to get him here to support the Wire. That's the other exciting part of it. Hopefully, we can leave a bit of a mark here and inspire kids to play and people to watch." The former Penrith and Wests playmaker has already had a chance to show his wares to the Warrington public, scoring in Ryan Atkins' testimonial game against Widnes. 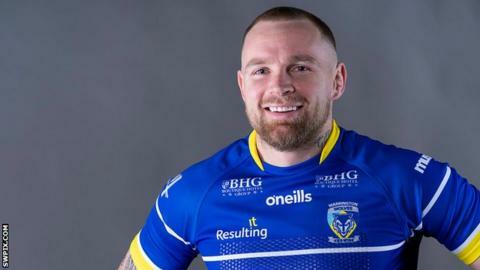 Blake Austin: "I couldn't believe the atmosphere at the Halliwell Jones when I attended last year." A self-confessed 'rugby league nerd', Austin is relishing the opportunity to play before passionate crowds in busy stadiums, starting with eight-times Super League champions Leeds Rhinos on Saturday. "We get to play round one at the Halliwell Jones," he said. "And that's something that really excites me. "I came to the home game against St Helens here last year. Some of the guys in the office were disappointed because the crowd hadn't quite turned out in numbers they'd hoped for, but I was scratching my head because I couldn't believe the atmosphere, which was something that really pleased me. "It's a 'small-in-numbers' sport in this country but there's a real tradition. You're lucky to have a really good live product. Back home we've got a really good TV product but we've lost that feel and that tribalism at the game. "It's something that's alive and well here."